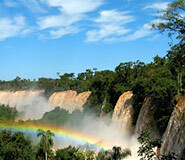 Discover Iguazu during your price guaranteed Brazil vacation. All of our Brazil tours have daily departures and are fully customizable. The Iguazu Falls, a UNESCO World Natural Heritage Site, are undoubtedly the principle motive behind a visit to Foz do Iguazu. This multifaceted set of waterfalls is a spectacular sight and is understandably ranked high among South America’s must-see attractions. The larger-than-life size and extension of the falls is what makes them so breathtaking. They are often likened to Niagara Falls, although in fact the Iguazu Falls are four times wider than their North American counterpart and some of the individual cataracts are even taller. The name Iguazu derives from the Guarani phrase for ‘great waterfall,’ yet to describe the Iguazu Falls as merely a great waterfall is to sell it short. The Iguazu Falls are a staggering 1.68 miles (2.7 km) wide, encompassing 275 distinct falls which cataract 65 feet (19 m) farther down than those at Niagara. The falls are located in the natural splendor of dense lush jungle, resplendent with subtropical flora and fauna that reside within the protected zone of the bi-national Iguazu National Park. Mist from the thundering water often cloaks the area in an atmospheric mystery, adding even more color to an already vibrant landscape in the form of rainbows amidst the billowing spray. The falls make up part of the border between Argentina and Brazil; the border with Paraguay is not far to the west. 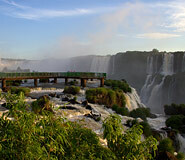 Consequently, the falls can be seen from either the Brazilian or Argentine side, and it is advisable to see both. The Argentinean side allows for much closer inspection, while the Brazilian side gives better panoramic view of the falls. The city of Foz do Iguazu is the most convenient entry point from the Brazilian side of the border. Located to the west in the state of Paraná, this is a bustling and modern town which receives a large number of tourists all throughout the year. 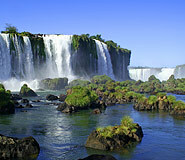 Foz do Iguazu features broad avenues lined with tall leafy trees and parks offering welcome shade in the warm weather. There is a great selection of venues for dining, lodging, and going out, ensuring that your Iguazu Falls vacation in Brazil will be both entertaining and comfortable. The verdant and biodiverse setting of the Iguazu waterfalls makes the experience all the more compelling for travelers. The Iguazu National Park, administered on both the Argentine and Brazilian side, is literally teeming with subtropical flora and fauna and can be explored on multiple days. Residing within the park are 450 types of birds, 80 types of mammals (including endangered species of jaguar and ocelot), and over 2000 species of flora: a nature lover’s paradise. While on the Brazilian side, travelers can obtain the best panoramic views of the entire Iguazu Falls system and can admire the might and grandeur of the falls. From here, the Garganta del Diablo (Devil’s Throat) can be fully appreciated with its 100-foot-high spray emanating fantastic rainbows and spectrums of color. The Parque das Aves (Bird Park) is also a great place for nature lovers to visit and is conveniently located near the entrance to the falls. This 12 acre (5 Ha) park shelters a wonderful collection of live exotic birds and butterflies. Although the birds are caged, their cages are very spacious and aim to recreate the natural habitat of the birds. Some enclosures are even large enough to walk into and get close to the birds. Toucans, macaws, parrots and flamingos flutter around in a colorful tropical display that is augmented by a huge array of butterflies, making the park a wonderful complement to the falls in order to see some of the wildlife up close. March, August, and September are generally the best times to visit Iguazu Falls because they are considerably dry months outside of the high travel season, meaning less crowds and lower auxiliary prices. January and February is when most Brazilians travel in the summer season, characterized by brilliant blue skies but often oppressive heat and humidity. December to March is also the apex of the rainy season, which doesn’t tend to create large problems in the well-facilitated park, but is still a variable to consider. At the same time, this is when the falls are most impressive due to all the rains that make it swell more than any other time in the year. Having personal transfers from airports to hotels (and vice versa) and to be picked up and delivered at our hotels before and after tours took so much of the stress and uncertainty out of the trip. This service allowed us to really enjoy the sights and not worry about the logistics of getting here and there. We were provided with often exceptional guides for specified tours that always met or exceeded expectations. Transport used was always clean and comfortable. Once again, thank you for a great vacation and I will certainly recommend Brazil For Less to those who would like a stress free holiday in South America. The highlight of the trip was the excursion to Iguazu. It is spectacular and amazingly beautiful. I recommend it to everybody. For an intimate experience at the Iguazu Falls, Hotel das Cataratas cannot be beat. It is the only hotel located inside the Iguazu National Park and the spectacular falls are only a leisurely stroll away. Spray from the falls ensures lush vegetation throughout the hotel’s luxurious and sprawling grounds. Elegant pink colonial-style buildings house nearly 200 rooms, each equipped with air-conditioning, LCD TVs, wireless Internet, a minibar, in-room safe, and hairdryer. To dine, guests can chose between two top-end restaurants and finish the evening in the bar. And of course, an inviting pool and spa await all visitors. Located about four miles outside of the city´s downtown, the Rafain Palace Hotel is the perfect base for your Iguazu Falls explorations. This vast hotel is great for the athletically inclined: there are three swimming pools, sports fields, a fitness center, walking paths, and even a climbing wall. If none of those caught your fancy, you might prefer relaxing in the Jacuzzi or cooking in the barbecue area. This extensive campus contains over 200 rooms and is a great location for large groups or conferences. Hotel Rafain Centro is a convenient and great-value choice for visiting Foz do Iguazu and the falls. It is located within walking distance from the city center and the bus to the falls is just a block away. Guests are encouraged to enjoy the outdoor pool, dine at the restaurant, and sip a tasty cocktail in the bar. The hotel offers a range of additional amenities to ensure a pleasant stay: a TV room, business center, fitness center, conference room, parking, wireless Internet, air conditioning, and in-room safes. within 24 hours. While traveling in Brazil you will have access to our local 24/7 emergency number.